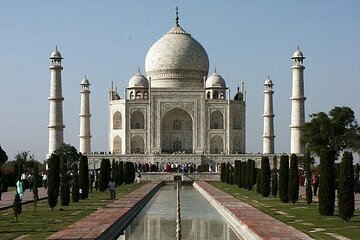 Visite el Taj Mahal y vuelva a Chennai a tiempo para la cama con este viaje en espiral al monumento más famoso de la India. Te levantarás muy temprano y volarás hasta Delhi, donde te llevarán en automóvil privado directamente a Agra. Después de una visita matutina al Taj Mahal, tendrá la oportunidad de ver una de las otras atracciones principales de la ciudad, el Fuerte de Agra del Patrimonio Mundial de la UNESCO, con un poco de tiempo para ir de compras antes de regresar a Chennai. Experimente el Taj Mahal en un día con pasajes aéreos de ida y vuelta incluidos. Great tour. Impressive how quickly the company arranged my tour with only 2 days of notice. Ravi, the driver in Delhi was outstanding. The airport and hotel transfers in Chennai were faultless. They were on time, friendly, professional, clean car and well presented. The only room for improvement would be the guide for Fort Agra and the Taj Mahal. The guide Rocky, did not tell me much I didn't already know or that I could read for myself on signs. He was overly keen to take me to shops that I didn't want to go to I suspect he gets commission for taking people to the shops. I felt a little rushed at the Taj Mahal and Fort Agra and would have liked more time there instead of at the shops. Eventually Rocky understood I didn't want to shop and stopped taking me to shops. Just need to be very assertive early on. On a positive note, Rocky took some great photos for me and he sorted out tickets so I didn't have to wait in any lines.